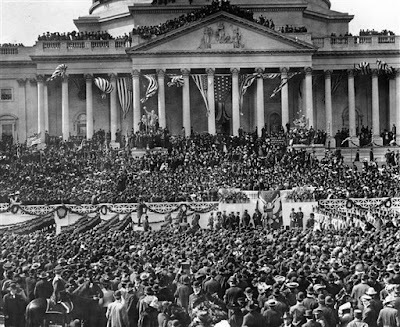 Sunday, March 4, 1905, Roosevelt took his oath on the East Front of the Capitol. 'The hair in the ring is from the head of Abraham Lincoln. Dr. Taft cut it off the night of the assassination, and I got it from his son - a brief pedigree. 'Please wear it tomorrow, you are one of the men who most thoroughly understand and appreciate Lincoln. I have had your monogram and Lincoln's engraved on the ring. Hay had had the ring engraved with the initials "A.L." and "T.R." He knew how proud TR would be to have his name joined with that of his hero. Roosevelt pledged that the Lincoln ring would remind him to "put human rights above property rights." The strands of hair on the ring had been cut away by a doctor just after Lincoln's shooting to look into his open wound. Charles Taft, another physician who treated Lincoln, willed the strands to his son, who sold them to Hay for one hundred dollars a month before Roosevelt's inauguration. Above: President-elect Theodore Roosevelt takes the oath of office on the east portico of the U.S. Capitol, March 4, 1905.